Steam (or boil) the pieces of purple yam for about 15 minutes, until soft. Allow the yam to cool for a few minutes, then transfer it into a mixing bowl, and mash it with a fork until smooth. Mix together the chopped walnuts, goji berries, and honey (warm the honey first if it is too solid to mix easily). Make a “cup” out of a piece of dough, fill it with the stuffing, and close the dough around it to make a ball. Repeat until the dough and the filling is used up. Heat a skillet over a medium-high heat, add the oil, then cook the pieces until both sides are brown and the center is warm, 5 to 10 minutes. Cook in batches if necessary. While Chinese mountain yam (Dioscorea opposita) is a key herb in traditional Chinese medicine, Dr. Yuan Wang, co-author of Ancient Wisdom, Modern Kitchen: Recipes from the East for Health, Healing, and Long Life (Da Capo Lifelong Books, March 2010), notes that other types of yam have also become popular in East Asia to promote health. These include the purple yam (Dioscorea alata, also known as "water yam" or "winged yam"; photo by Natalia del Carmen). Although unassumingly tan-brown on the outside, once you cut it open you can see the inside is a vibrant purple. 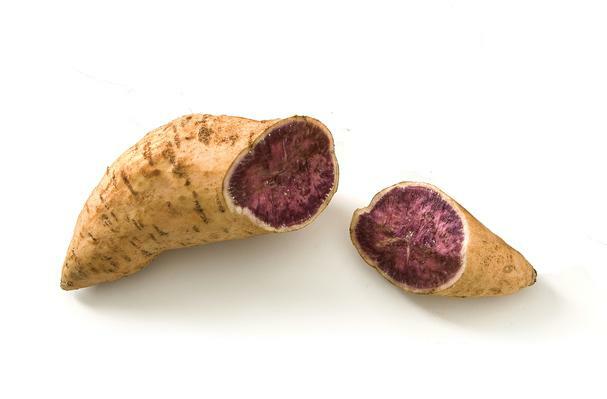 The purple yam is featured in Philippine sweet desserts, Vietnamese soups, Indian dishes, and Hawaiian cuisine, as well as Chinese recipes. This Chinese recipe using purple yam blends the smooth texture of the yam with sweet rice flour, accented with a sweet, nutty filling. The dessert also happens to be wheat-free, dairy-free, and vegan. We found purple yams at a local Asian supermarket, helpfully but discretely labeled “purple yam,” among the many other similar-looking varieties of yam being sold. Any dried fruit can be substituted for the goji berries. Dried apples, for example, are lovely. Also, other seeds or nuts—such as pumpkin seeds, chopped almonds, black sesame seeds, pine nuts, or chopped peanuts—offer other possibilities instead of walnuts. The basic yam recipe is good for counteracting general weakness, fatigue, lack of appetite, and constipation. Goji berries help the vision and walnuts are believed to contribute to longevity. For those familiar with the language of traditional Chinese medicine, the purple yam strengthens the Spleen qi and counteracts Blood stasis. With goji berries, this dessert helps to nourish the Blood and the yin, increase the essence, and improve vision; with walnuts, it helps strengthen the Kidneys, warm the Lungs, and moisten the Intestines.